Celebrating B&B Italia’s entrepreneurial five decade design journey, we continue our series with a look at long-time collaborator Antonio Citterio one of the group’s most successful design partners – while also reviewing his latest collection, the very classic Édouard. Antonio Citterio first began his relationship with B&B Italia when Giorgio Busnelli’s father and company founder, the late Piero Ambrogio Busnelli, was cementing B&B Italia’s place in Italian design history. That was 1978 and the Diesis sofa, still in production today, began a partnership with B&B Italia that has produced some of the company’s most successful designs. 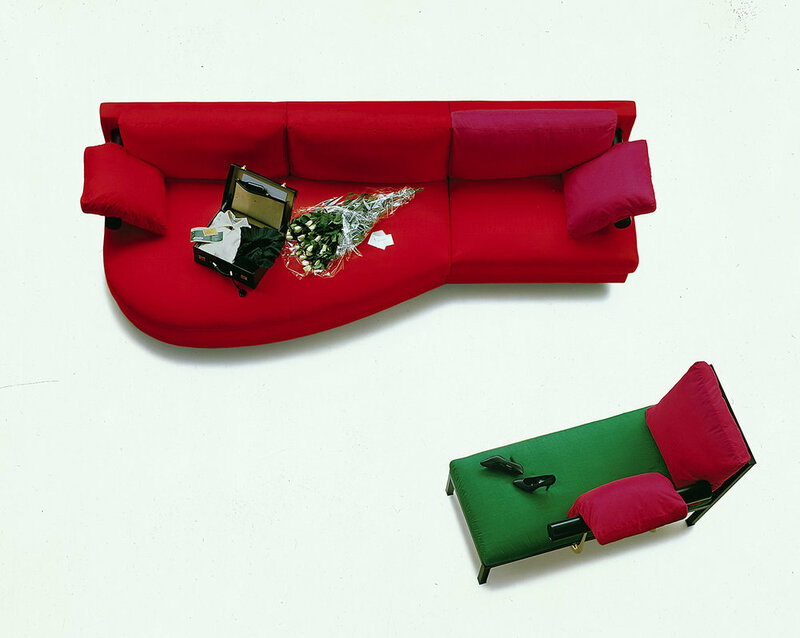 Antonio Citterio's Sity sofa was designed in 1986 and won B&B Italia the coveted Compasso D’Oro. As a starting point, Diesis represented B&B Italia’s ability to blend craftsmanship, in the traditional leathers and saddle-making upholstery, with new technologies that would ensure quality, durability and production performance for the future. The Charles sofa was launched in 1987, joined by the Charles Large in 2003 and Charles Outdoor in 2010, and still holds the award for most popular design across all the collections. While the Sity sofa designed in 1986 won B&B Italia the coveted Compasso D’Oro. The B&B Italia Charles sofa continues to be one of the Italian brand's most popular and celebrated designs. Over the past four decades, Citterio has produced a staggering catalogue of chairs, tables, sofas and armchairs for B&B Italia, highlights including the Mart leather armchair and the Flat C storage system, and sofas including Ray, Michel, Richard and Gio. While he also oversees the group’s sister brand Maxalto and its collection that combines highly crafted precious woods, metals and tailored upholsteries. The Flat C storage system by Antonio Citterio for B&B Italia was designed to house entertainment systems and books in the smallest space possible. Research and experimentation is synonymous with the B&B Italia brand. For a company willing to support new ideas and technical development, it’s a collaboration that both suits and expands Citterio’s design process as an architect. Understanding buildings is by no means a separate endeavour to understanding how furniture should work within them. The two go hand in hand and B&B Italia’s contract division is stronger for the insights Citterio brings. Antonio Citterio's most recent sofa design for B&B Italia - the Édouard sofa. The newest collection by Citterio is the classic Édouard. In form, the sofa and armchairs have a distinctly 1950s flavour, the sofa in particular a nod to the lighter, more shapely armchairs of the mid-century modern style Its lightness moves away from the long, lean rectangular forms made popular by the Charles. Here, Citterio’s approach is to provide comfort through a high backrest, with an optional headrest, and the flexibility of armchair, sofa and sectional seating units to suit the interior. With all of Citterio’s designs you can’t help but notice he is thinking about the space a piece of furniture might rest, and already has a solution in mind. See Antonio Citterio’s collection for B&B Italia at Space Furniture: Space Furniture Australia / Space Furniture Asia. It’s day two of exhibitions, talks, launches, parties and installations in some of Milan’s most private and public spaces, earning Milan Design Week its pole position as design leader. B&B Italia is celebrating the 50th birthday of the groundbreaking UP 5&6 armchair designed by Gaetano Pesce in 1969; Glas Italia has released designs in iridescent colour and fluid form, and GTV has collaborated with Michael Anastassiades who plays with the traditions of wood. Describing his work as "minimal, utilitarian and almost mundane, yet full of unexpected vitality”, designer Michael Anastassiades designs products, furniture and lighting that strikes a balance between art and the practicalities of function, while bringing a certain magic to each design. Design takes centre stage in a short film created by Italian furniture brand B&B Italia in collaboration with OffiCine and Elle Decor Italia. Inside a classic Milanese apartment, life unfolds around the Atoll sofa designed by Antonio Citterio. and an elegant set created by Studio Silenzi. Designers Nipa Doshi and Jonathan Levien recently launched Bay, an outdoor seating collection that explores the traditions of weaving, and craftsmanship, and continues the duo’s collaboration with B&B Italia that began with the Almora chair four years ago. Featuring new designs fresh from Milan Design Week, Space Furniture launches the iconic B&B Italia collection with a series of new look interiors that explore the creative collaboration between the two groups which began over 30 years ago. While the 1980s are back in a big way in the fashion houses of Paris and Milan, the furniture industry is also having a revival – or in this case a relaunch – of one Italian-Austrian designer Paolo Piva, and his most famous design the Alanda. The Triennale design museum is buzzing and the playful 'Temple in the Forest' pavilion at Palazzo Litta by artist Asif Khan has become one of the week's best places to relax. more space makes a beeline for Porro, GTV and the work of legendary architect Luigi Caccia Dominioni inside the frescoed hall of the Umanitaria. Here is what we discovered on day four.